Ireland is a partitioned country. The consequences of that have been deeply damaging for the people of this island. In the north a unionist one party regime ruled and abused citizens for 50 years. Unionist repression and a society in which Catholics were treated as second class citizens led to a civil rights campaign for justice. When that was attacked by the state there followed decades of conflict. Martin McGuinness played a huge role in bringing that conflict to an end. The southern state was run by a conservative political and business elite whose greed and corrupt practices ultimately led to the current dire economic crisis. As a result there is now a climate of despair and of fear. Half a million are unemployed; thousands more face losing their homes; one third of our children are going without one or more of the basic necessities of life. This includes a warm coat in winter, a bed and bedding of their own, and three meals a day. And each day brings more news of job losses. This is unacceptable. Never was there a more important time for republican politics. Never was there a greater need for a President who can represent all that is good and vital and compassionate and caring about the Irish people. Ireland needs a Peoples President - a President who can bring hope; who can lift spirits and reach out to and embrace all the people fo this island. A President who has the ability to break down barriers between people and who has the acknowledged experience to work with those of opposite opinions. Martin is an outstanding political leader. First as Minister of the Education when he began the work of transforming education in the north, and then as Deputy Fiurst Minister Martin has worked closely with unionist leaders like Ian Paisley and Peter Robinson, building a partnership power sharing government which has defied the begrudgers and is delivering for citizens. Martin has demonstrated enormous courage and taken a strong stand against those who would seek to plunge Ireland back into war. He has travelled widely, ably representing the people of the north on the international stage. He knows many world leaders and is recognised by then as a capable and effective leader and representative. Martin has a deserved international reputation as a peace maker. He is a statesman who has taken huge personal and political risks in his life. As Sinn Fein’s chief negotiator during the peace process, time and again HE demonstrated immense personal leadership and an ability to persuade others to take decisions and initiatives which many thought impossible. There would have been no peace process without his enthusiastic encouragement. The next seven years will be enormously challenging for the people of this island. 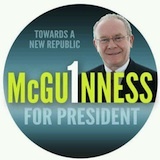 Ireland needs a President who has a vision of a fairer, better and more prosperous Ireland. A President who can represent every section of our society, nationalist and unionist, urban and rural, republican and loyalist, and those from the new immigrant community. Martin will ensure that the Aras is a welcoming place for all sections of society across this island, and in particular for those who have been marginalized. He is uniquely placed to reach out to the Irish diaspora and to engage with it in building a new Ireland. Martin is for a new Republic which has citizens rights at its heart. He believes totally in the core republican values of equality and fairness. He believes in people and community and in civic virtues. He has the ability to rise above the party political and to successfully represent all of the Irish people. I am confident that he will build on the excellent work of President McAleese and her husband Martin. And as we enter a period of unprecedented historic anniversaries, including the 100th anniversary of the 1916 Rising, it would be especially important that we have a President who is committed to uniting Ireland and ensuring that the principles and values that are expressed in the Proclamation become a reality. This is a time of great challenge for all the people of Ireland. We need positive but authentic leadership. I believe that this election will give Martin the platform to continue the work which he has led in the North and in the peace process and to put it on a national footing. If elected he will draw the average wage. He will dedicate himself to a genuine national reconciliation and the unity of our people. He will personify hope in the great genius and integrity of all the people of this island, Catholics, Protestants and Dissenters. I would appeal, if Martin contests this election, for people to join in this campaign, including people in the North and across the diaspora who are denied a vote at this time. The campaign will give citizens the opportunity to make a stand for a better Ireland, for a united Ireland.